Mark Galiza was born in the Philippines, and moved to Hawai‘i when he was seven years old. 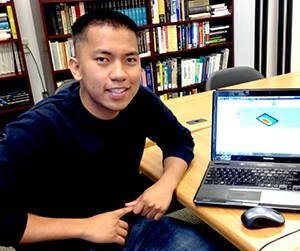 Mark is a 2013 alumnus of Maui High School and a Class of 2013 Gates Millennium Scholar. He is currently a Sophomore at the Univ. of Washington, Seattle, where he plans to major in Mechanical Engineering. Mark is a part of the UW Engineering Without Borders Program, and one day he would like to work in the aviation industry or in the sustainable/renewable energy field. In his spare time, Mark enjoys playing basketball, going on outdoor adventures, or simply just enjoying the company of others. Project Abstract: Optical systems are subject to thermal expansion when placed in extreme temperature conditions, resulting in a reduction of data quality. Therefore, creating three-dimensional models and conducting finite element analysis of these systems is crucial in order to analyze how these systems respond to the conditions. This internship involved two projects that focused on designing, modeling, and simulating components of optical systems. The first project involved analyzing the entire MOTH telescope to determine whether proper heating is achieved with the use of silicon heating pads and insulation — a desired internal temperature of approx. 20?C should be maintained, even when conditions outside the telescope are below freezing. To accomplish this goal, we replicated all of the different components of the MOTH telescope using Autodesk Inventor. Then, using the Finite Element package, we conducted various thermal simulations to analyze the internal temperature of the telescope enclosure. We determined that each heating pad must produce a maximum of approx. 75 watts to meet the criteria. The second project, involving the CyroNIRSP instrument, was to design a mount to hold a prism mirror firmly in place without deforming the optical surface by greater than 79 nanometers RMS. To accomplish this, we devised a proposed design consisting of spring plungers and dowels. We conducted various stress analyses to determine that the maximum force that can be exerted on the prism is 151 newtons (33 lbf). For both optical systems, our results provide a good foundation for the design team to build a model, test their systems, and determine whether changes should be implemented.